Next week, on October 7th, Troy and his guests will explore the idea of “author’s craft” as it relates to creating digital texts. On October 14th, Troy will lead a discussion on the process of conferring and response to student writers as they create digital texts. We would invite you to join us on Wednesday at http://EdTechTalk.com/live at 9:00pm Eastern / 6:00pm Pacific USA Wednesdays / 01:00 UTC Thursdays World Times. Join The Digital Writing Workshop Ning. 20:36:18 kdveiten: How do I tune in to Teachers Talking to Teachers in 24 min.? 20:36:54 SusanEttenheim: be glad to help you when I get back - going to grab a quick supper! 20:48:41 Greg Lumb: Tell me more, I'm new at this. 20:49:17 Greg Lumb: what's tonight' s show? 20:50:41 Paul Allison: We'll start in about 10 minutes. 20:51:05 Greg Lumb: Thanks Paul. I will try and check back in. 20:56:22 Paul Allison: Welcome all! 20:56:42 mhennessy: I'm trying to find the 9pm Teachers Teaching Teachers webcast. Can anyone tell me where to access it? Thanks. 20:57:22 shantijb: I'm looking for Teachers Training Teachers too. 20:57:29 bak5: I am also! 20:58:38 SusanEttenheim: hi everyone - welcome! can you all hear ok? 20:59:10 SusanEttenheim: have you clicked the listen icon? 20:59:15 mhennessy: no - and is this the teachers teaching teachers webcast? 21:00:08 SusanEttenheim: can you hear us now? 21:00:24 SusanEttenheim: bak5 how are you listening? 21:00:48 SusanEttenheim: hi everyone welcome! 21:00:51 bak5: OH.....I hear "welcome"
21:01:10 SusanEttenheim: we welcome you to participate here and to listen at the same time! 21:02:23 SusanEttenheim: just speak up! 21:02:33 Sara Beauchamp-Hicks: Hello everyone! 21:02:47 kdveiten: I'm listening through itunes. 21:02:56 SusanEttenheim: who is having trouble? 21:03:12 mhennessy: is there supposed to be video? 21:03:32 shostetler: I'm not sure what to do to view the Teachers Teaching Teachers program. 21:03:49 SusanEttenheim: please don't be overwhelmed - the chat may go fast tonight with so many people here! 21:04:54 shostetler: I can hear it now, thank you! 21:04:58 SusanEttenheim: you should all be hearing audio too - how are you doing? 21:05:01 demacisaac: anyone else not hearing? 21:05:15 SusanEttenheim: are you not hearing demacisaac? 21:05:18 shostetler: All I've heard so far is Welcome... should I hear more? 21:05:41 SusanEttenheim: what are you using to listen? 21:05:56 SusanEttenheim: is everyone else hearing multiple people? 21:06:09 capalene: I am hearing multiple people. 21:06:16 SusanEttenheim: thanks again cathy! 21:06:23 shantijb: I can hear all of you. 21:06:35 bak5: I do not hear multiple people talking and not sure if I am hitting the right button. 21:06:36 SusanEttenheim: yes - good! 21:06:50 SusanEttenheim: we will keep helping people! don't give up if you need help! 21:07:04 mekuter: thank you for the listening link! 21:07:50 SusanEttenheim: ok there are many people here tonight but I'd still like to do our usual introductions - would you all please introduce yourself - where and whwhat do you teach? 21:08:00 SusanEttenheim: bak hang inthere we'll help you! 21:08:55 capalene: I am an elementary writing coach. I would for Greenville Public Schools in Greenville, MI. Troy is going to be working with our secondary folks this year. 21:09:00 SusanEttenheim: anyway, I'm Susan and I teach at Eleanor Roosevelt HS in NYC - where and what do you all teach? 21:09:22 lisanatwick: so i need to have 2 windows open .. this one and a different one for edtechtalk A?? 21:09:24 shostetler: My name is Stacey (shostetler) I am a second grade teacher in a rural school. 21:09:47 shostetler: I teach at West Beaver in central PA.
21:09:51 beccabran: I'm Breanne, a middle school English teacher from Pottsville, PA.
21:09:59 jboushehry: I am Julie and teach 4/5 looping class in Indianapolis, IN. 21:10:20 bak5: I am finally hearing it! 21:10:25 smurchie: Sharon Murchie, Bath High School. I'm supposed to be one of the participants speaking next week, so I'm trying to see how this all works! 21:10:36 Troy Hicks: Hi Sharon! 21:10:40 shostetler: Is there anyone here due to the Wilkes University Class requirements? 21:10:48 liptonjl: I am sorry- Is this "Teachers Teaching Teachers?" 21:10:50 smurchie: Hey Troy. I got this far. That's good, right? 21:11:00 shantijb: I am a Wilkes student. 21:11:08 Troy Hicks: Sharon -- this is great! Glad you could join us this week, and next! 21:11:35 SusanEttenheim: this chat will all be published so don't worry if you have trouble catching it all tonight! 21:12:34 mekuter: Glad to see we are all in the same boat here! 21:12:39 SusanEttenheim: no such thing here lnatwick! 21:12:50 Troy Hicks: Hi Everyone from Wilkes! 21:13:28 SusanEttenheim: my sister in law and family - in milwaukee! 21:13:49 SusanEttenheim: how is everyone doing now? ok with sound? 21:13:55 beccabran: I student taught at the middle school! 21:14:13 tbbrad: Where are you now? 21:14:21 Greg Lumb: I'm not getting sound yet?? 21:14:26 SusanEttenheim: anyone still need help?? 21:14:36 SusanEttenheim: ok greg we'll fix your sound! 21:14:40 beccabran: tbbrad, I am teaching in Pottsville, PA. I am loving it. 21:14:49 beccabran: What subject do you teach? 21:15:17 tbbrad: Who did you student teach with? 21:15:26 SusanEttenheim: ok- so now more than tech talk! 21:15:35 SusanEttenheim: have you all seen this book? 21:15:49 bak5: Tell me the book again? 21:16:19 bak5: I am not "seeing anything"
21:16:42 SusanEttenheim: what do you mean bak? 21:17:12 SusanEttenheim: you should just be hearing and seeing this chat - we don't do video... all ok? 21:17:40 demacisaac: I'm not sure what else to try to get audio? 21:18:24 SusanEttenheim: hi jenny please introduce yourself! 21:18:35 SusanEttenheim: whre and what do you teach if you have just joined us? 21:18:38 mekuter: I have not seen this book before. 21:19:50 SusanEttenheim: what a big crowd tonight! 21:19:55 SusanEttenheim: how did you all find us? 21:20:15 shostetler: The Wilkes group got this from a prof.
21:20:16 capalene: i'm a nwp fan on facebook and saw the announcement there. 21:20:31 studentedtech: I am trying to log into the Taechers Teaching Teachers Yes, Wilkes Assignment! 21:20:37 Troy Hicks: Curious to hear from Wilkes students -- what is your assignment? 21:20:56 SusanEttenheim: great greg welcome and to everyone welcome! 21:21:01 SusanEttenheim: what is Wilkes? 21:21:13 tbbrad: My fellow 8th grade english teacher uses the writers workshop in his classroom. I will pass on this info with him as well! 21:21:40 SusanEttenheim: ahh that's what I thought! 21:21:41 Paul Allison: Has anybody here done "writer's workshop"? whatever that is. 21:22:49 SusanEttenheim: ok speak up! writer's workshop participants??? 21:23:46 SusanEttenheim: wow carol.. hi!! and welcome! 21:23:57 SusanEttenheim: quite a crew tonight - right? 21:24:20 SusanEttenheim: so please join in troy's conversation here... are you "doing" the writing process??? 21:24:56 mekuter: Would someone through the book link out again please? 21:24:59 SusanEttenheim: capalene - if you or anyone else has a question/ please post here and we will interrupt and ask our panel! 21:25:02 shostetler: We do the writing process in 2nd grade... I even have a simple ditty that I teach my students to remember the steps. 21:25:10 carolteach4: Hi, Susan - so happy to see other folk being introduced to these wonderful online professional development pieces even if it came through an assignment. I hope they like what they are hearing as see the value in it. 21:25:12 SusanEttenheim: what is your ditty?? 21:25:38 SusanEttenheim: carol - you are such a veteran now! pls help mewelcome everyone! 21:25:57 SusanEttenheim: thank you sara! 21:26:18 Sara Beauchamp-Hicks: You're welcome, Susan! 21:26:48 SusanEttenheim: some of the logging in and out is when people get bumped out of the chat - if that happens just come back! 21:27:00 SusanEttenheim: say more jenny? 21:27:26 SusanEttenheim: lnatwick what do you mean by public places? 21:28:36 lh: I want my students to blog and respond to each other's work on the internet and computer. If this is an open deocument and every-changing, I wonder about the liability as a middle school teacher. If students post outside of the classroom, cyber bullying...Does anyone have expereince with this or have any advice? 21:28:37 SusanEttenheim: ahh what age lnatwick? 21:29:10 carolteach4: I listened to a live Elluminate webinar led by Adora Svitak (ll year old girl who has been blogging for years) giving teachers a "A Kid's Eye View of an Innovative Classroom". She was amazing and modeled writing a piece by using input from all of us-said kids love to participate in collaborative writing. 21:29:19 SusanEttenheim: what are you reactions to the story chris is sharing? 21:29:28 smurchie: If you are using googledocs, the only collaboration is between you and the student, when they share their document with you. Other students can't "bully" if they're not a collaborator on the document. 21:30:43 SusanEttenheim: do you have experiences where you feel the tone has changed because of digital writing? 21:31:00 smurchie: I also use nicenet.org which is an oldschool discussion board...very safe, very simple. No anonymous bullying as long as you are forcing students to use their real names. 21:31:10 shostetler: I have not done a lot with googledocs with my studentsj. 21:31:24 Troy Hicks: Writing workshop teaching requires that we build community so writers trust one another -- how does what happened to Katie in Youth Voices represent this idea? 21:31:38 mekuter: I've started my 6th and 7th grade music classes working in Edmodo. It has worked well for us. 21:32:04 SusanEttenheim: what is edmodo? 21:32:08 bentan14: how do i make my school a google apps school? 21:32:24 carolteach4: @bentan14 - we have gone with google apps for education - teacher/administrator can upload a whole class of students at a time and control access for safety feature. 21:32:46 SusanEttenheim: carol do you have the link handy? 21:33:34 shantijb: My district has a student learning community in Moodle. Lots of opportunity to collaborate..but safe. 21:34:11 smurchie: Yes, if students share with each other, they can peer edit. But as long as you are also a collaborator, you can revert to an earlier draft at any time. So, you can control the conversation or step in if necessary. This is regarding googledocs. 21:34:46 SusanEttenheim: what do you all see as the difference and value of online within a class and then outside your class - as our panelists are describing..
21:35:07 smurchie: We are a googleaps school. So, the kids don't have real e-mail addresses...their googleaps login is a fake. The kids don't need e-mail access to access googledocs. 21:35:35 shostetler: It would be great to have that kind of access... those with googledocs. 21:35:50 demacisaac: Hey finally have audio,,,this is a long story and hidden icons! :D anyone else with out audio? 21:36:22 mekuter: online within a class is a great intro to interacting with their fellow students but online to the world gives them real world connections. 21:36:35 liptonjl: how do we get audio? 21:36:39 carolteach4: We did not have email before google apps for education for our kids; however, we limit their email to other members of our own school domain. It's for safety reasons. 21:36:40 SusanEttenheim: mekuter - do you have an example? 21:36:52 jenny brandon: it is our job as educators to teach the kids safety, what's appropriate, what's true/false believable -- how can we do that if we can't get online!!!!!!!!!!!! 21:37:22 mekuter: my world and your world are not the same and my feelings on a topic could be drastically different based on my experiences. 21:37:23 SusanEttenheim: jenny do you know who to ask to unblock? 21:37:26 Sara Beauchamp-Hicks: It is very helpful. 21:37:48 jenny brandon: I'm workin' at it, I'm workin' at it! 21:38:15 Sara Beauchamp-Hicks: It is about always keeping the discussion open...moving forward...but the important thing is to keep talking. 21:38:19 capalene: there is something to say about the Internet feeling "less safe" because of the media hype with cyber stalkers and the like. I agree that it's not any less safe than anywhere else, parent perception of what might happen is another story. It seems like it's out of the district's control. 21:39:38 jenny brandon: POSITIVE EXAMPLES OF STUDENT USE! 21:40:10 mekuter: Very true! There are so many positive things happening. It just doesn't get the press. 21:40:13 SusanEttenheim: yeah! patdilo you are in! 21:40:24 Penny Kittle: They were so inspiring... their stories were funny and poignant and wise. What an opportunity for our rural NH kids. 21:40:24 abrooks: We could also try to get the administrators involved in the same type of projects. Let them get experience with it. 21:40:45 patdilo: I'm finally able to acknowledge in the chat room! 21:40:48 lnatwick: how is it that students seem to forget from year to year??? 21:40:56 mekuter: @abrooks That might be the key. They need to do it for themselves. 21:41:49 jenny brandon: ning used to be blocked at my school and now not! 21:42:09 mhennessy: It's just about impossible to get sites unblocked in Philly!! 21:42:48 SusanEttenheim: so many wonderful links now! 21:42:59 SusanEttenheim: don't worry they will all be in the show notes! 21:43:07 Penny Kittle: I took Dan Beatty's "Knock Knock" slam poem to a meeting to show them why I needed You Tube unblocked in my room. Since then, they've given all teachers access to You Tube. I agree we have to be convincing.. show the value and keep pressing. 21:43:41 jenny brandon: zamzar's my best friend! 21:43:57 demacisaac: lip click on "participate live" under "search edtechtalk"
21:44:35 SusanEttenheim: and it was such a small site - no one would even think to block it! 21:44:39 Troy Hicks: @mahlness - Agreed. But, could the district agree to private hosting through a service like Wikispaces? 21:44:43 abrooks: a lot of times the ones in charge are just going with whatever is already being blocked by the filter service they use and don't realize what tchrs need. There does need to be a procedure in place. 21:45:16 smurchie: Thank you for saying that, Sara. Teachers have to keep talking, and continually advocating for themselves and their students and the technology we need. The tech guys and the school admin are trying to do what's best for kids; we have to make the noise and show the POSITIVE EXAMPLES and what our kids are missing out on if we don't have access. 21:45:26 jenny brandon: Isn't there a new agreement between Youtube and Warner Bros as fo TODAY? Morning Edition this morning? 21:46:01 SusanEttenheim: ooh jenny sounds interesting.. does anyone know about that? 21:46:20 abrooks: Does teachertube strip the sounds? why not use them? 21:46:39 smurchie: Teachertube takes HOURS to load. I haven't found it reliable. 21:46:53 capalene: i'm sorry folks... gotta log out for tonight.. i'll be back next week. 21:46:58 jasonK: i use it all the time. 21:47:12 SusanEttenheim: please come back any and all wed 9-10 eastern time! 21:47:33 SusanEttenheim: how are you all doing? anyone overwhelmed by the big crowd tonight? 21:47:45 jenny brandon: this is a blast! 21:47:54 smurchie: It might be our stream. I've used teachertube, but downloaded the videos to save so I don't have to stream them live. That works; if I get on teachertube at a crazy hour, I can save the videos for later use. 21:48:10 mahlness: @susan - beats the heck out of the PD I had today! 21:48:11 carolteach4: Wow! That is interesting. I did not know YouTube was doing that. This will be an interesting test of "fair use." I listened to that session with Renee; I don't think we're there yet. 21:48:14 Troy Hicks: Don't know all the details, but I wonder if that model would help the district ease their fears? 21:48:43 SusanEttenheim: mahlness ! ha this evening every week keeps me going! 21:49:02 abrooks: Isn't fair use only for that moment of teaching and shouldn't be avaible to all at any time without password protection? 21:49:04 SusanEttenheim: thanks jenny! did everyone get that? 21:49:10 Penny Kittle: I agree about the PD.. this live chatting and connecting with people all over is so much better than much of what passes as PD I'm afraid. 21:49:29 carolteach4: @ speaker - does you allow kids to use their Google Apps for Education email to connect with anyone outside the domain???? 21:50:06 smurchie: our googleaps is district only. The kids can't get out. 21:50:14 Paul Allison: carol, how would you limit them? 21:50:26 abrooks: WAs it easy to get your district to use google apps? 21:50:54 carolteach4: I think that age is the key. Many of our middle school teachers are more comfortable with trying the collaborative google tools as long as a secure, walled community is inplace. 21:51:00 Penny Kittle: Very easy... in our district our tech people offered free workshops on how to use google docs during our PLC time in the morning. 21:51:06 jasonK: Susan...I really like that angle. 21:52:08 tbbrad: Our school went to google docs this school year as well. All students use the google docs apps now instead of microsoft office. 21:52:27 jenny brandon: Here's a little irony for you - in our district, some of our TEACHERS are having a hard time distinguishing between what is and is not appropriate in Facebook etc.! 21:52:27 carolteach4: That is exactly the analogy I used with my 7th graders this morning - world of work- in introducing them to our google domain. 21:52:29 liptonjl: I have to get to bed :) This has been fun! I'll be back sometime! Thanks for the ideas! 21:52:56 Penny Kittle: so I'm not the only one who is usually asleep at 10? Or are all of you on Pacific time? 21:53:09 SusanEttenheim: jenny - are those the same people who are figuring it out in person too? 21:53:16 patdilo: Awake here on the East Coast! 21:53:22 Penny Kittle: Hey... is anyone on from Oregon my home? 21:53:25 carolteach4: EST - got to get up at 5:45am - still, this conversation is worth it. 21:53:42 jenny brandon: No, those are the ones who don't use tech in their classroom, just at HOME! 21:53:50 SusanEttenheim: I'm up at 515 but this is my one late night a week! 21:53:52 demacisaac: I did censorship of authors in my masters. I'll look for links. 21:53:56 Penny Kittle: yes, great conversation. I appreciate how open you all are. 21:54:26 Penny Kittle: Seattle!!! I love that city. 21:54:49 jenny brandon: it's nearly 9:00 - I usually fall asleep in front of the TV at 7:00! 21:55:10 SusanEttenheim: hi sr welcome! 21:55:16 SusanEttenheim: where and what do you teach? 21:55:33 SusanEttenheim: wow troy time flew tonight! 21:55:53 jenny brandon: almost through? 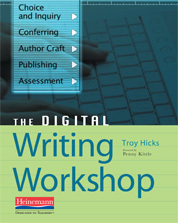 21:55:53 Troy Hicks: ... what is the one essential digital writing tool that you would suggest people try to use with their kids and how does that fit in with a writing workshop approach? 21:55:54 Penny Kittle: No kidding. I wish we could meet for coffee Saturday. 21:56:09 tbbrad: Thank you ! 21:56:22 jenny brandon: thank you! 21:56:25 jasonK: I have to go as well...Thank you everyone for so much great information...I can't wait to share your program with my colleagues at work. Goodnight. 21:56:26 Sara Beauchamp-Hicks: Penny--We will see you at UPRA next week! 21:56:27 carolteach4: Actually, even educators have to pay the $10.00 for the domain name. 21:56:32 SusanEttenheim: coffee - same time same place penny! 21:56:41 Penny Kittle: yes yes. I'm very excited. I've never been up there! 21:57:03 patdilo: can we get this in print? 21:57:29 smurchie: I guess, Troy, I would have to say googledocs, for the ability to conference with students one on one, the publishing opportunities, the ease of linking to googlesites and other googleaps, and the peer editing and group project ease. 21:57:32 SusanEttenheim: what's your favorite tool everyone? 21:57:57 carolteach4: Yes, our kids have personal gmail accounts, but I told our 7th graders that when they log into our domain, it is "work" -that is school -oriented. 21:58:15 Penny Kittle: I love making movies. We started with digital commentary and the passion that erupted in the room when students realized all they could do was just amazing... it was a contagious, exhilerating ride. Students saw so quickly all they could do, and yet it was all composition... it's still my favorite. 21:58:29 SusanEttenheim: and I'll also say that I'm a regular listener of Seedlings - do you know that show too? 21:58:45 SusanEttenheim: have you all used Voice Thread? 21:59:03 SusanEttenheim: oooh google wave.. can't wait to get involved with that!!! 21:59:27 Sara Beauchamp-Hicks: Did they finally send out the Google Wave invites? 21:59:32 carolteach4: I love Youth Voices, but I don't feel comfortable sending 11 and 12 and 13 year old kids there; Many of the topics are mature. 21:59:51 SusanEttenheim: sara - I heard this week.. but I'm waiting.. who knows?? 22:00:02 carolteach4: Does anyone know how to use Google Apps with Moodle? 22:00:09 Paul Allison: Most of those "mature" topics were written by 12 year olds. 22:00:29 Penny Kittle: I believe you on final cut... i'm just so intimidated! 22:00:35 carolteach4: Gee, Paul! That is great! I guess I'm just a fraidy cat. 22:00:53 Paul Allison: I'm always talking about how topics need to be written so that the second graders on Youth Voices will be comfortable. 22:01:24 carolteach4: In our school, we have gone backwards. We can not publish our school newsletter on line if kids are pictured with names attached. 22:01:48 jenny brandon: who would believe we'd be encouraging phones? 22:02:06 carolteach4: @inatwick - that's you voiced what I was trying to say. 22:02:19 abrooks: could you also use voki for that? 22:02:36 lh: Thanks so much for all the great information! Chat with you next week. 22:02:46 SusanEttenheim: voki for what abrooks - I've looked at that but not really used it? 22:03:11 jenny brandon: I'll be up all NIGHT with these links! 22:03:15 carolteach4: Is there a charge for drop.io? 22:03:30 Sara Beauchamp-Hicks: Have fun, Jenny! 22:03:35 Paul Allison: there are pro accounts... very inexpensive. 22:03:39 SusanEttenheim: don't burn out tonight jenny! there's always more! 22:03:54 carolteach4: @jenny - that's my problem. I can't do it tonight. I've been up way too late all week. 22:04:26 SusanEttenheim: come next wed with your stories and questions! 22:04:37 SusanEttenheim: that's a good one jenny! 22:04:48 jenny brandon: goodnight and thanks so much! 22:04:57 SusanEttenheim: please join us again everyone! 22:04:59 lnatwick: which week is the vidoe craft one? 22:05:13 SusanEttenheim: get a skype account and we can call you into the conversation live too! 22:05:27 abrooks: do you just need our account? 22:05:32 Cathy E: Have to go to bed - great show! 22:05:44 SusanEttenheim: night cathy thanks for all your help! 22:05:48 Sara Beauchamp-Hicks: Don't forget to join the NING http://digitalwritingworkshop.ning.com/ More links there; but more importantly...join in the conversation! 22:07:33 carolteach4: Sounds like a fantastic show. I am so glad these shows are availble later as recorded streams; it is so hard to absorb it all in one sitting. 22:07:58 carolteach4: That's so funny, Susan. 22:08:32 Sara Beauchamp-Hicks: Paul: Did you get a new bike? 22:08:44 carolteach4: Thanks so much for sharing, Troy. 22:08:50 Troy Hicks: Thanks everyone! 22:08:50 jenny brandon: Oh yeah the bike! 22:09:07 mekuter: Thank you all! 22:09:15 carolteach4: How did you students like the show? 22:09:21 Ruth: Thanks for the welcome Yes I am here for an assignment. It has been very interesting and I 'll be back to check on my one time too. 22:09:22 SusanEttenheim: night everyone thank you! 22:09:34 beccabran: It was very interesting! Thank you! 22:09:50 Troy Hicks: Please do get in touch if you have questions for your assignment! 22:10:04 mekuter: Goodnight all! Now I need to go work on my assignment post!